Home / Professional Enhancement / UK GradResearch Live! Anna Bedsole, a doctoral candidate in English (pictured above), won first place in the Three Minute Thesis category with her presentation, Gothic Heroines and #MeToo. Below are the 2018 winners of UK GradResearch Live! The finals were held in Worsham Cinema on Tuesday, October 30, 2018. Click here to watch videos of all contestants! Second Place - Daniel Chavez, Hypothetical Bias: Do Real Questions Give Real Answers? People's Choice, Second Place - Chi Peng, Are Anti-HIV Drugs Affecting Platelet Function? Click here for a list of all 24 finalists. UK GradResearch Live! was born out of the The University of Queensland’s 3-Minute Thesis (3MT) competition, a research presentation initiative that challenges graduate students to effectively communicate their research to a general audience, with a single slide, in three minutes or less. Click here to learn more about the history of 3MT. 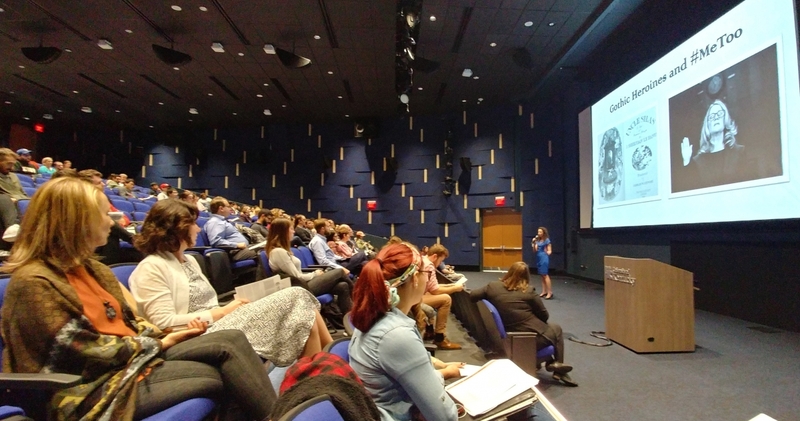 The Graduate School and Graduate Student Congress have hosted 3MT competitions at The University of Kentucky since 2013, and our participants have found them an excellent way to practice their communication and presentation skills while sharing their research with their peers. This year we’re rebranding and expanding the competition to reach a larger audience across campus and throughout the local community with a public showcase, numerous prizes, and a reception. Keep reading to learn more about UK GradResearch Live! Below are links to videos and slides decks from the preparatory workshops held by The Graduate School leading up to UK GradResearch Live! Click the link above to watch a video and see the PowerPoint slides from our workshop. NOTE: All presenters should review the international 3MT COMPETITOR GUIDE found here on the University of Queensland (Australia) site. The 3MT portion of UK GradResearch Live! will follow the traditional 3MT rules below, while the Showcase will follow the same basic rules with exceptions stated below. Click here for a printable rubric with rules and judging criteria. The competition is limited to students currently pursuing a master's or doctoral degree at the University of Kentucky and who have not previously won a campus-wide 3MT competition. A single static presentation slide is allowed (no slide transitions, animations or 'movement' of any kind are allowed; the slide is to be presented from the beginning of the oration). No additional props (e.g. costumes, musical instruments, laboratory equipment, etc.) are permitted. Presentations are limited to 3 minutes maximum; competitors exceeding 3 minutes are disqualified. Presentations are to be spoken-word prose (e.g. no poetry, raps, or songs). Presentations can be anywhere from 1 to 3 minutes, but still must not exceed 3 minutes. Slides are not required, but a single static presentation slide is still allowed (no slide transitions, animations or 'movement' of any kind are allowed). A single 3”x5” note card is allowed. Judges will score the presentations based on the rubric criteria above. Below are some different resources related to UK GradResearch Live! and Three Minute Thesis. For specific questions, please contact Morris Grubbs. Click here for "UK at the Half" radio interview with graduate students about the 3MT®, which aired Jan. 28, 2014.